Just before you start cooking the deep fried turkey, you must need to remember the risks that go with it. Knowing the hazards associated with deep frying a turkey will urge you to do interventions to protect yourself and keep yourself safe. So what are the dangers in deep frying a turkey? 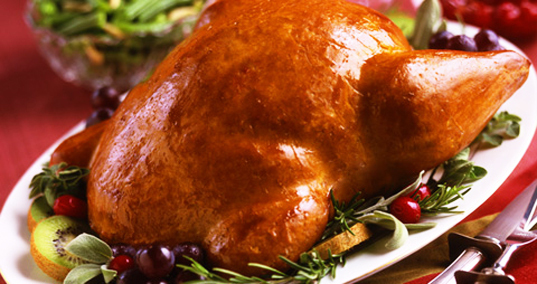 You may need to use huge cooking pot full of hot oil when deep frying a turkey so that a turkey would fit in. Due to this, there is a large risk associated. One, even a small quantity of hot cooking oil that can come into contact with your burner can start a large fire. Your oil less turkey fryer may excessively heat up and there is a possibility of combustion when there is no thermostat control. A casserole that is too much filled with oil or if the turkey is not thawed, there is a tendency of spilling the oil when putting the turkey into it. The lids of the cooking pot may be too hot to handle that it can severely burn you. And as mentioned earlier, the things involved are large so once it spills, it may cover a large surface area. Since we have already tackled about the dangers in deep frying a turkey, now we know that it is never easy and you should be cautious. Now, let us focus on the recipe in making a deep fried turkey. Let us start with the preparation of the deep fried turkey . Remove the neck and the giblets such as liver, and gizzard, from the cavity of the turkey. Cleaning the turkey when you are about to deep fry it is similar to the way it is being cleaned when you are about to roast it. Take off the leg ties from the turkey. Position the turkey in a cooking basket and put it in the casserole. Pour water to immerse the turkey until the water level is 1 to 2 inches from the level of the turkey. Then you remove the turkey from the casserole and measure the water level. This procedure will help in measuring the amount of oil that needs to be poured into the cooking pot to deep fry the turkey. Empty the cooking pot when you have already measured the water level. Fill the casserole with oil to the level that was measured using the water. Set the thermostat control to 375 degrees fahrenhheit. You should wait until the oil will heat up and that is an estimate of 20 to 30 minutes. Once the oil has already heated up, you may now immerse the cooking basket with a turkey inside it positioned horizontally in to the oil. To protect yourself from oil splatters and to contain the oil, put a cover on the cooking pot. If you note that the color of the skin of the turkey is brown and it floats, that means it is already done. Then you drain the turkey. Go to https://en.wikipedia.org/wiki/Turkey_fryer to read more.